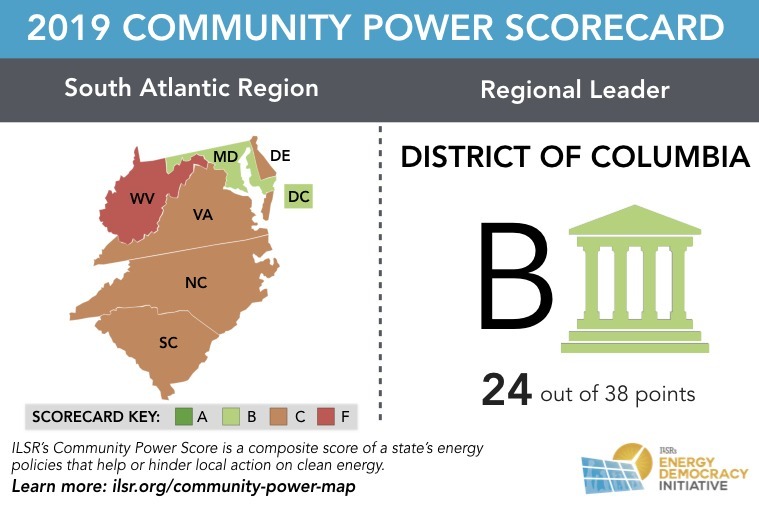 How do policies in neighboring states stack up in support of local clean energy? 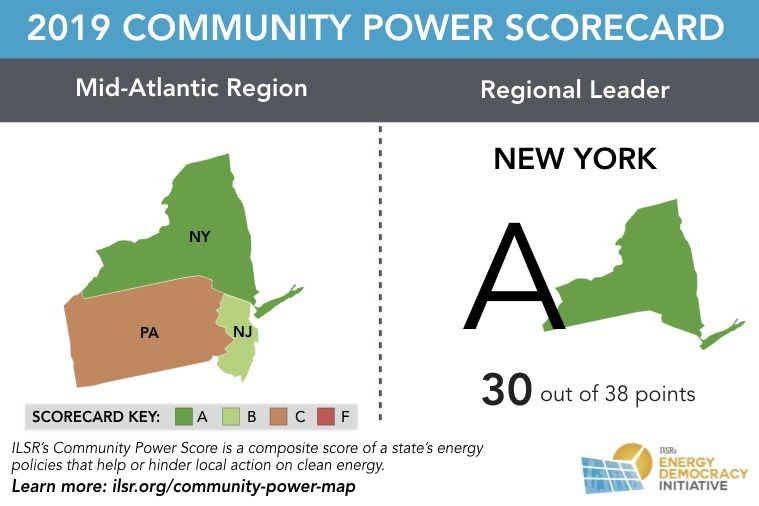 A comparison of how well policies in nearby states support distributed energy, including rooftop and community solar, provides insights into which states are regional leaders and where cross-pollination of state policy ideas that support local energy might improve areas that lag behind. Indeed, state energy policy matters when it comes to local, renewable energy. 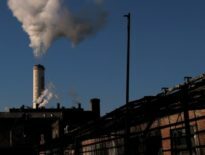 As many state legislatures consider consequential clean energy bills this year, states can either maintain the status quo where monopoly electric utilities reign or else transform the energy system to one of energy democracy — where more community decision-making and ownership keeps the benefits and profits of clean energy investments local. 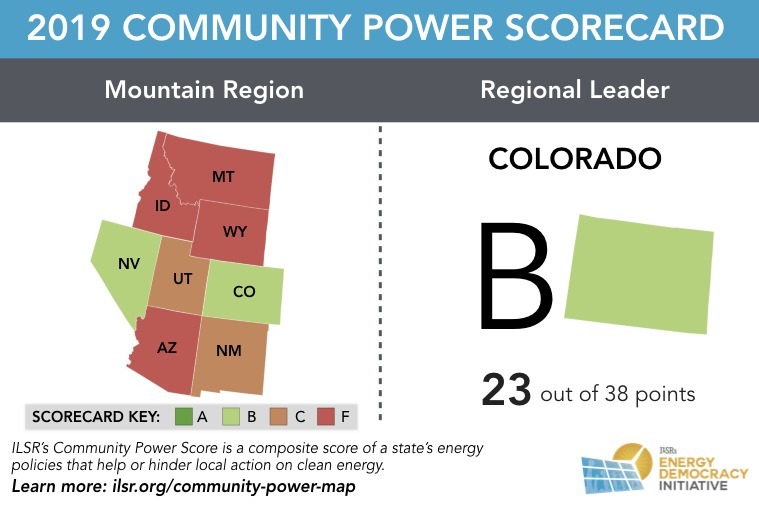 Drawing on results from the Institute for Local Self-Reliance’s 2019 Community Power State Scorecard released earlier this year, we developed a new series of infographics to illustrate how states compare to others in their region and where advocates, lawmakers, and community members can look for model policies nearby that support local, clean energy. 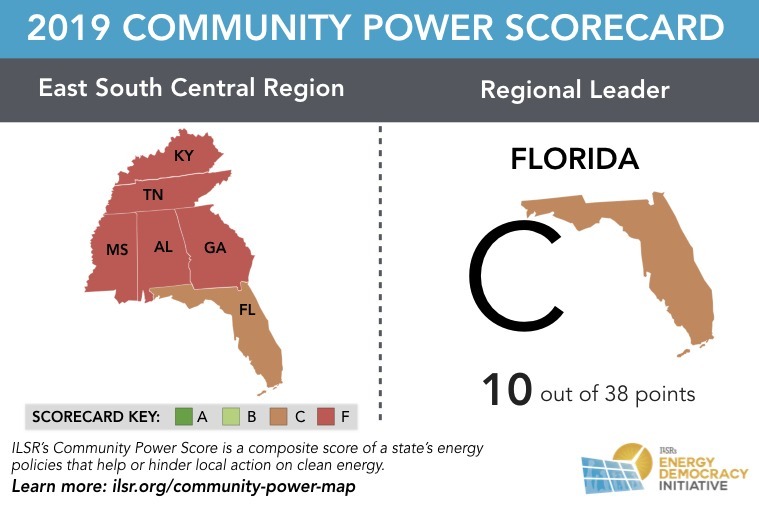 In case you missed it, explore the 2019 Community Power Scorecard and our companion post Why ILSR’s 2019 Community Power Scorecard Matters. 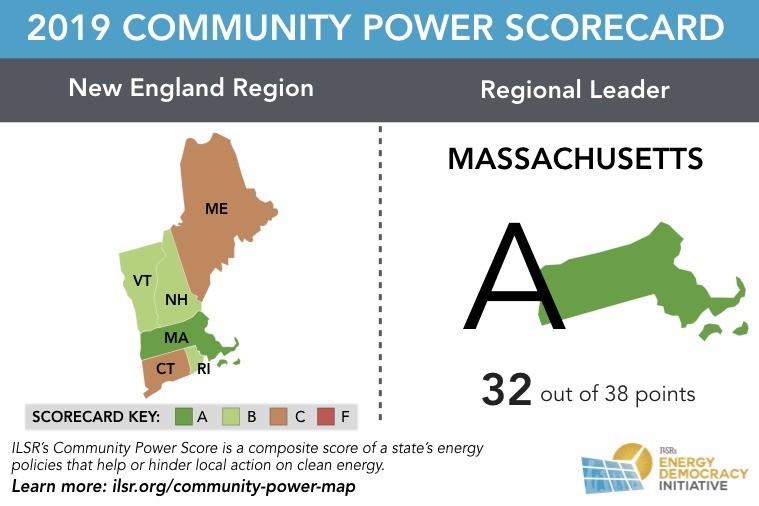 Find more information on state policy and local clean energy programs on our interactive Community Power Map. Both context and geography matters for clean energy technology, policy, and advocacy. As we have mapped previously, southern states have abundant solar resources; while states across the Great Plains are known for their particularly abundant wind resources. 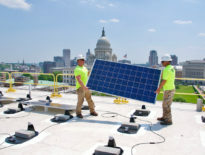 To craft policies that enable local clean energy, lawmakers in states that received a failing Scorecard grade such as Iowa or Wisconsin may find it easier to point to and replicate the success story of neighboring Minnesota’s community solar program than such programs in more distant states including Massachusetts or Maryland. 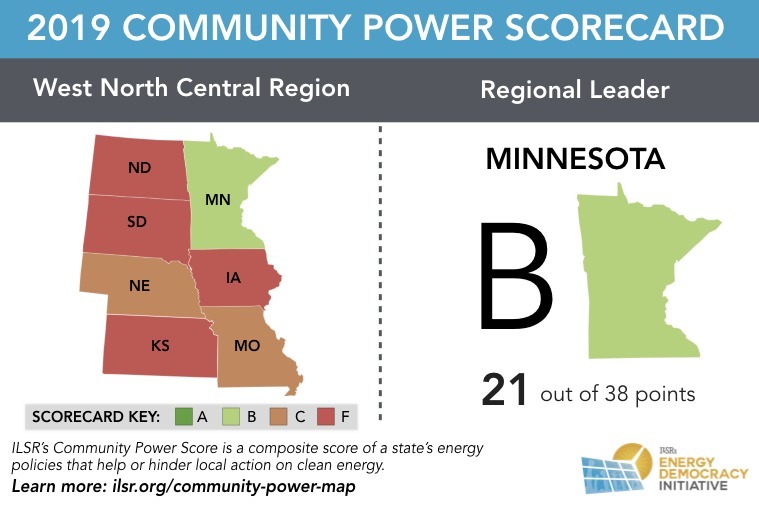 Regional coalitions of clean energy advocates and funders such as the RE-AMP Network in the Upper Midwest push for clean energy policies within and across state lines and provide unique ways to exchange ideas and build new partnerships that strengthen energy democracy. These are just some of the reasons why taking a broader, regional look at state policies can be useful. To illustrate this, we took a closer look at this year’s scorecard to find which states rank highest compared to their peers across nine regions of the country (corresponding to U.S. Census Divisions). The result is a series of new infographics highlighting which states scored highest by region. These visuals also helps us compare across regions, illustrating which parts of the country claim a greater number of high scoring states than others. 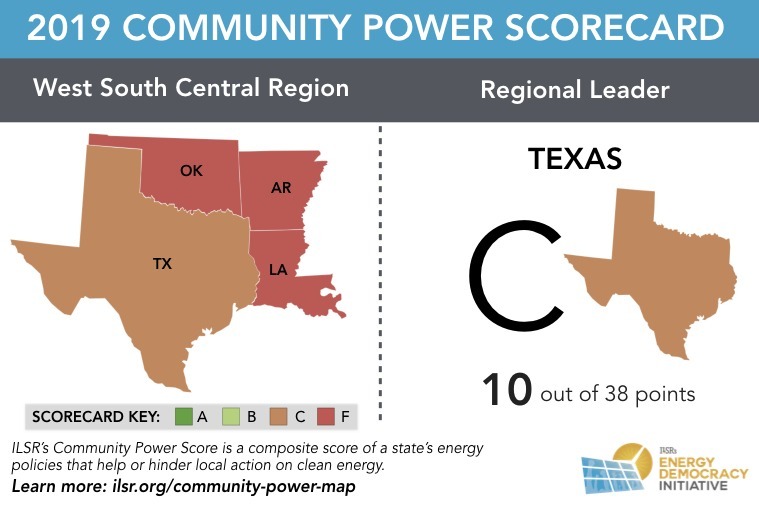 These regional comparisons provide some hope for most states, because most have a neighbor with superior policies supporting energy democracy. Two regions––East South Central and West South Central––are laggards, with the “best” states sporting “C” rankings. 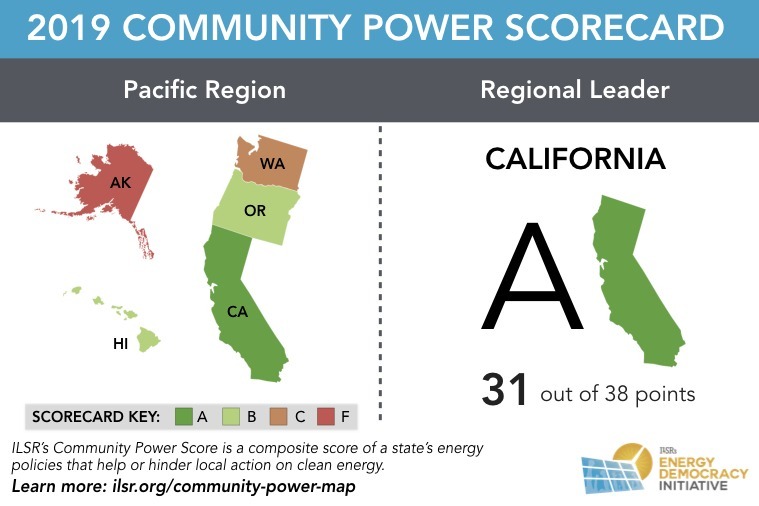 For these regions, policymakers may need to look farther afield for leadership on policies that support local, clean energy. 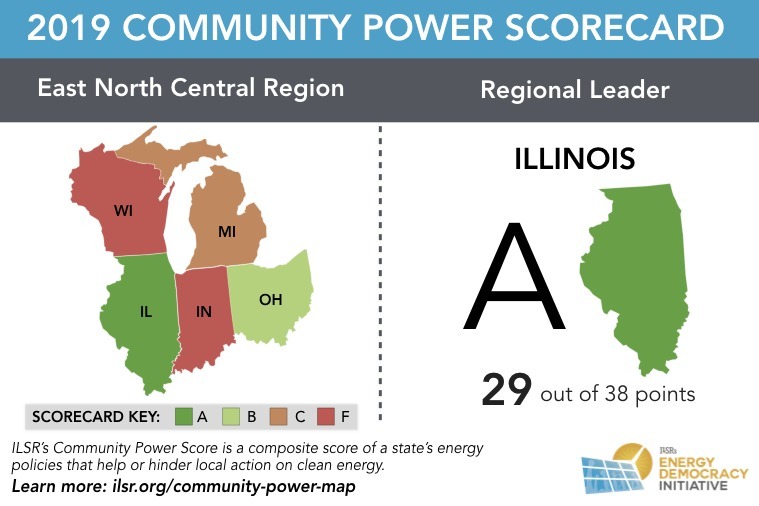 To explore state policies and other programs that support local power in the energy sector in more detail, be sure to take a closer look at ILSR’s Community Power Map. In addition, we will continuing to track state policies that enable local clean energy, releasing our Community Power Scorecard and related comparisons in future years.